Tommy Baker, a player for the Moffat County Cutthroats, follows a ball he hit during practice earlier this month. Baker and the Cutthroats competed at the Triple Crown Baseball Colorado State Championships over the weekend, but went 0-4 in group play. — The team went 0-4 and was outscored 57-11 over the weekend. The Moffat County Cutthroats have faced disadvantages this season, like playing against older teams with full rosters. During the Triple Crown Colorado State Championships in Longmont, the odds were too stacked to overcome. 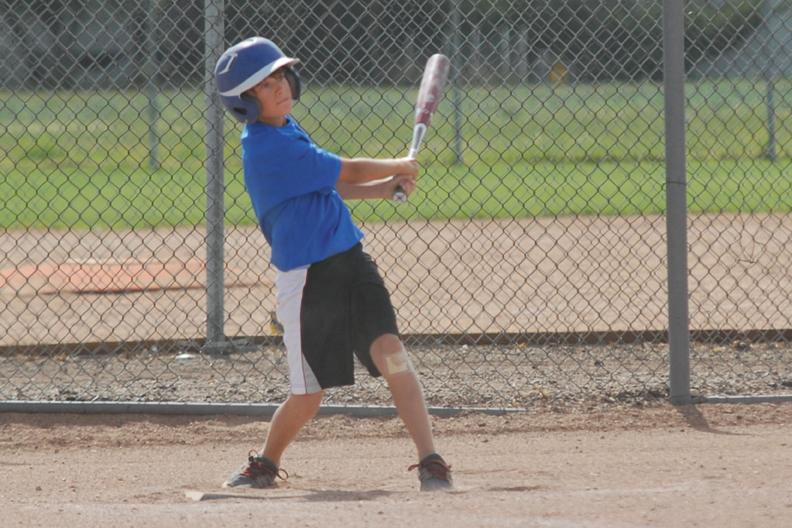 The local team played in the 12-and-under Division 2 tournament, went 0-4 for the weekend, and was outscored 57-11. Although the results look decidedly one way, coach Mark Nielsen saw positives to take away from the tournament. He said his team didn’t play as poorly as the numbers suggest. Against the Chatfield Chargers, one of the top teams in the state, the Cutthroats were down 8-7 after three innings. In the fourth, Moffat County did not score in the top of the inning, but Chatfield tacked on 14 runs in its turn at the plate. A 22-7 score ended the game on a mercy rule. Nielsen said the Chatfield game was a good example of each game over the weekend. Still, Nielsen said he’s proud of his team. Moffat County has been helped this season by a positive attitude from players, another reason the team’s in high spirits during practices. Players know there are still games to play. The Cutthroats’ next and final tournament of the season will be July 27 and 28. Nielsen is hoping to host the tournament at Loudy-Simpson Park, but said it may have to be played in Newcastle, depending on the number of teams.